... of review quotes so far. “a dark masterpiece” Anne Brooke, Writewords. 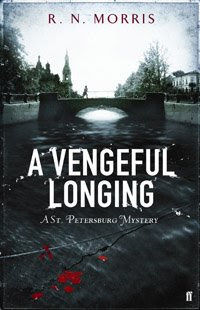 “This novel keeps you questioning and guessing until the end... Morris's brilliant writing will have you on the spot in St Petersburg in 1868 in your head and trying to control emotions that Porfiry Petrovich will not let get in the way of his investigation.” It’s a Crime…or a Mystery. Well done, Roger - as ever! And goodness how I envy you your reviews and your marketing strength! Thanks Anne - but hey, you don't do so bad yourself. I've been blessed with the reviews and quotes - yours included. I really appreciate your support, which has been constant. OK, Roger, so where have you hidden all the bad reviews? Actually, I've just finished it myself. My only mistake was to put it down halfway through and then get distracted by some life-stuff before picking it up again a week later. All those Russian names - I had no idea who'd killed who, and who cared! But, after some serious re-scanning, I was back in the 19th Century and eager to finish. Wonderful stuff, Roger. And the plaudits are well-deserved. Can't wait for Vol 3. Eagerly awaiting the next, Roger. In the meantime, congrats on some wonderful reviews and let the sales match the quality written about! Hi Paul, thanks for the kind words. As for bad reviews, I go round buying every single copy of the publication they appear in, then burning them in an industrial incinerator I have bought specially for that purpose. If they're online, I hack in to the host server and delete the master files. I then hire a contract killer to deal with the reviewer in question. Hi CFR, and thanks! Especially for providing one of my review quotes! As for "let the sales equal the quality written about" - we can only hope. Currently I am investing all my hopes for sales in the American paperback of Gentle Axe which is due to come out at the end of March. Penguin are seriously getting behind it.